The Kalamazoo brand was made by Gibson in the late 1930s and early 1940s as a budget priced alternative to their 00-series. This example had seen some hard times over the years but a fresh rebuild has done wonders to the structure, tone and playability. 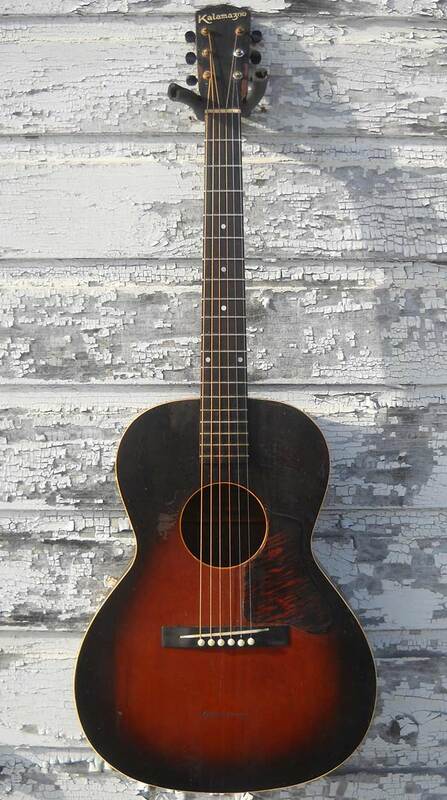 Battle scars aside, this is a great value for Gibson made flat top from this period. SPECS: 00-size body, 14-fret neck, ladder-braced spruce top, mahogany sides and back, paddle headstock, original tuning machines, mahogany neck with soft but chunky “V” profile, bound soundhole, top and back, original rosewood fretboard with updated frets in the worn spots, rosewood bridge, bone pins, bone nut and saddle. Nut width: 1 3/4”, String Spacing: 2 3/8”, Scale length: 24 3/4”, Upper bout: 10 1/4“, Lower Bout: 14 3/4”, Body length: 19 1/8”, Widest body depth: 4 3/8”, Overall length: 40 1/8” , Neck thickness at 1st fret: 1”, Neck thickness at 5th fret: 1”, Action: 3/32”, string gauge setup: custom lights 52-11 gauge standard tuning. CONDITION: Solid woods in excellent rebuilt condition. Three repaired top hairlines and one repaired side crack. Finish has scuffs, crazing, edge wear with bumps and bruises everywhere. Evidence of prior tailpiece install. Tiny edgelifts around original pickguard. Top bracing was updated to accommodate modern string tension. Other work included neckset, leveling fretboard/frets, back binding, rosewood bridge and a sweet setup. SOUND: Dusty, woody and dry just like a ladder braced 40’s Gibson small body should sound (It even retains the original paper label inside). It really shines as a strummer or flatpicker. Generous string spacing at the saddle is a huge bonus. The chunky neck might discourage some thumb wrappers but overall playability is a dream.